In this new feature we want you to tell us about the riders you remember from any era of the sport. They can be dirt-track pioneers, current Grand Prix riders or performers from any point in between. Dudley Jones kicks off the series with this article on Australian star Peter Moore. If you'd like to contribute a piece, and it doesn't have to be meticulously researched or cover every aspect of a rider's career, then drop us an email at speedwayplus@hotmail.com or use our new Online Form. The magnificent Veltins Arena in Gelsenkirchen was the venue for the $100K shoot-out in the last round of this year's GP series. Harry Ward was on hand to capture a dozen excellent pictures of this most impressive new speedway track. Thanks to Craig Saunders and Manuel Wuest for also sending in pictures of Veltins. Mike picks a selection of riders who were at their peak in the late seventies and early eighties. Former Hackney favourite Bo Petersen fills one of the reserve positions. "Talking of Bluey Wilkinson and Tiger Stevenson, I'll always remember the opening night at Custom House of the revival period (1964 - 1972). I think it was the Mayor of Newham who gave the official opening speech. In it he said that he had been a big speedway fan himself and recalled the days when the great Tiger Wilkinson and Bluey Stevenson had ridden for the Hammers...!" "As the 'boss' of the Speedway Updates site, the above article interested me. We did actually look into the possibilty of live video results via the (then new) 3G capability on phones. Unfortunately as live results in whatever format, is not welcomed by quite a few promoters, it was a non starter, plus also the question of copyright. I still think it's possible in the future and is still in my plans to introduce once all stumbling blocks have been removed (oh and when I work out the technical side!)" "I would definitely subscribe to this. I'm new to speedway and the thought of travelling hundreds of miles from Newcastle only for it to be rained off doesn't sound too good." "I saw almost all the White City meeting home and away that season and I have all the programmes and my blue and red scarf. I wonder if my old friends are still around I know from Wembley and White City? What great memories and a great article." "Regarding Mark Meynell's recent excellent aerial photos of California's Costa Mesa Speedway: some viewers might assume that the large oval prominent in the pictures is the speedway venue; however, it should be pointed out that the speedway is actually the less-obvious oval visible right-of-center in the top photo, and left of center in the bottom photo. The Costa Mesa speedway track is only approximately 100 meters in length. The larger oval is the 400-meter athletics track of a neighboring school." Some random thoughts on the current state of the sport. We'd encourage you to use the feedback form at the back of the page to come up with your own additions to the list. Globetrotting Charles McKay is our photographer again this week, this time he turns his camera on the Lodz circuit in Poland. Ben is a sixteen year old Rye House fan, though not many of his team have ridden regularly for the Rockets. Don't forget that our articles are now available as PDF (Adobe Acrobat) files that can be saved to your hard disk or printed. Simply click on the "PDF Version" links next to the article headlines above. Thanks (once again) to Charles McKay for pointing out that the tracks at Chorzow and Katowice, which we'd listed separately on our track pictures page, are one and the same place. "A great site, the pictures of the tracks bring back memories of going to certain meetings with my long time best mate, the late Bob Arnold. One of my favourite posessions is the panoramic view of Belle Vue's Hyde Rd stadium before the bulldozers went in, I always enjoyed going there even if we got beat heavily. I rarely go to a track now without my camera. Great site keep up the good work." "Nice to have seen the interview which brought back many memories of the late 60's and 70's, which were really a spectacular period in the sport, and in hindsight they did unfortunately lose their way a bit. I also have many fond memories of the Glasgow Tigers, whom I first started watching at the White City, moving on to Hampden, Coatbridge and the Blantyre circuits, thereafter heading overseas. The sport is now quite a slick spectacle, with the advent of the more powerful engines and slicker tracks having weighed heavily on the end results and subsequent lack of passing etc., although in all fairness I have seen some marvellous racing on the current set ups. Who can forget the punch ups and other stage managed situations to get the fans booing and howling abuse at the resulting culprits? Speedway, as in most other sports today, lacks "characters". Tennis had the likes of Nasty Nastasie and John McEnroe, and speedway used to have a real selection of riders the fans loved to hate also. One incident I fondly remember involved 'Bad Boy' Reidar Eide from the Monarchs, who had shot into a tremendous lead in a run off for an individual meeting at Hampden, perhaps the Scottish Open, with an opponent, Arnold Haley I think. Reidar incensed the fans by dramatically slowing down a couple of times and waving at Arnold to catch up. Just as the poor man was on the verge of coming even Reidar would speed off into the distance again. The result was a howling crowd, baying for Reidar's blood, afterwards deliriously cheering when the referee excluded him for ungentlemanly conduct. Another incident involving the same Reidar, sorry about that, had him being carried out to his bike on a stretcher, thereafter going out to produce an absolutely blistering race with a practically track record race time. Great stuff indeed and I think speedway does in fact miss the showmanship that these events provided in the past. Great stuff indeed and the quality of the riders seemed so much better than it appears today, however I would imagine that equipment now has a far greater influence than in that era. As to the future I sincerely hope the sport can reinvent itself and attract a whole new generation of fans, although must admit the crowds are mainly older diehards. Unfortunately also it is still regarded as a cloth cap throwback from the past, which is most unfair indeed. Anyway as I have been living in Brazil for quite some years I found it was a real pleasure to have explored and read through the site dedicated to speedway and the interview was most interesting and the start with Glasgow Tigers brought back a few memories. " On Tuesday it will be 30 years to the day since White City Rebels clinched the British League title at Wolverhampton. Lee Dunton was the team manager of the Rebels that season, now living in Vietnam he was happy to recall the events of that season and comment on the infamous claim that the title win owed much to the use of Rider Replacement all season long. Pilot and speedway fan Mark Meynell has come up trumps once again with some more of his aerial photographs. We previously featured his pictures from Berwick, this time the location is the slightly more exotic California and the world famous Costa Mesa speedway. 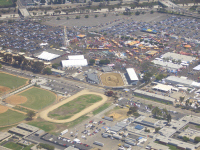 The track is situated in the Orange County Fairground. Paul has followed Coventry since the seventies, not too surprising therefore that he selects this 'Great Dane' to lead his team. New website defunctspeedway.co.uk aims to collate photographs, memories and histories of tracks that are no longer with us. The Viccary family are still very keen to hear from anyone who remembers the late Alf Viccary's racing career. There's an emotional plea from one of the family on our Can You Help? page. Our Track Photographs page, which now has links to ~130 different tracks, has been re-organised into country specific sections. Hopefully this will make it easier to find the track you're looking for and to make it obvious where gaps exist in the collection. "I think the Golden Helmet events he mentions were a much watered down affair. The real Golden Helmet races at Custom House involved the likes of Aub Lawson, Jack Parker, Jack Young, Ronnie Moore and company up to the 1964 days when the National League finished. Those events were almost always a way of pulling extra people through the turnstiles. And there were already big crowds then as well. " "The one lap flying start record at West Ham was revived for a short spell in the 1960's and at the end was jointly held by Ken McKinlay and Sverre Harrfeldt at 17.4secs for the 415 yard circuit. Robert Rogers is right about Briggo's form at West Ham . He was "almost" unbeatable at West Ham but was beaten one memorable occasion. Whenever Briggo came to West Ham he would make even great riders like Fundin and Mauger look ordinary, nobody kept in front of him for more than about half a lap, but on one occasion in about 1967/8 West Ham's popular but erratic reserve Stan Stevens , who usually struggled to keep a regular team place, made the start and somehow managed to hold on for four laps with Briggo practically up his exhaust pipe but failing to find a way past. It could only happen in speedway!" "Robert Rogers, as he usually does, has provided his many 'followers' with more fascinating facts. I have only my memories to rely upon. I did realise that I had omitted to say that the 'Golden Helmet' was a 'best of three races' event and was, as Robert reminds me, sponsored by the 'Sunday Pictorial'. This event was certainly staged in the immediate post-war years and, obviously, continued to be staged long after. It would be nice to learn if Bluey Wilkinson's one lap rolling start record was beaten and by whom. When mention is made of Bluey Wilkinson then it immediately brings to mind that other great pre-war legend, Tiger Stevenson. I was taken, as a young lad, to the Custom House track, just before the outbreak of war, and vividly remember Tiger Stevenson being pushed from the Pits and onto the track, to the reverberations of the Tannoy System blaring out the Jazz hit 'Tiger Rag' and the chanting by the crowd of 'Hold that Tiger'. It was a brand of magic that has stayed with me all this time - but that's another story! I have that recording and play it from time to time if only to re-live that unforgettable era. Little did I know that some 31 years later, Tiger and I would be involved on a project. As a result, Tiger loaned me two of his personal scrapbooks, one carrying a photo sequence of his challenge series with Frank Arthur in Australia, which I believe, Tiger lost by three to two. A great man in every respect. As a 'pre-war' kid, I was brought up on a diet of Bluey Wilkinson and Tiger Stevenson. I cannot adequately describe the impact of it all. It was as though their names were on everybody's lips. Not only were they real live heroes, they were also folk heroes. They will forever be recalled, certainly in the annuls of local West Ham sport, but wherever and whenever in the wider world, this unique sport that is Speedway Racing, is being discussed, documented, recorded or whatever. They are quite simply irremovable Speedway legends whose association with West Ham Speedway, is indelibly etched in the history of the sport and as such, we who followed West Ham Speedway through the years, should feel immensely privileged. " "Do the original Gold and Silver Helmets still exist, who has them? I would like to see the match race brought back, with the Elite League version raced on a monthly basis in front of the Sky camera's. The Premier League should revert to the old system where the holder races against the opposition top scorer after every league match." 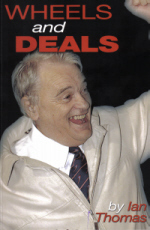 'Wheels and Deals' the auto-biography of Workington promoter Ian Thomas has now been reduced in price to £10 including posting and packaging. So what can you expect from this book about the former junior rider, close-up magician, one-time England manager and promoter of numerous tracks? 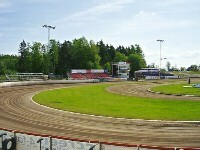 The Motala circuit in Sweden is home to the Piraterna speedway team. These pictures were taken by Charles McKay. Norman is a Peterborough fan and was their junior team manager at one point. He includes his son Gavin in his selection alongside current Coventry co-manager Colin Pratt. Brian Bailey is willing to pay a very good price for a 1936 World Final programme - Can You Help? On a similar theme - Tracy Holmes is looking for three World Pairs programmes to complete his collection - Can You Help? "Great pictures, my daughter and myself are in two of them taken at the tapes. Keep up the great work." "Having just looked at one of the newest items on speedway plus "Blunsdon bloggers tour of Sweden" I'd just like to say well done Graham. For me it's the perfect introduction to the Swedish scene. Apart from a half dozen GP's in Sweden I haven't got round to visiting the domestic scene in Sweden but it really does come across as a great adventure. The trials and tribulations of such visits are, I suppose, part and parcel of the journey but how bad is is when you are away in a place far from home in a country lane knowing you are probably going the wrong way? I do this all the time usually with very little fuel. A really nice part was the meeting up with Rune Holta. He comes across as a really nice bloke on the telly so I'm pleased that this was supported by the breakfast meeting. I know from my own similar experience from staying at the same Stockholm hotel as Todd Wiltshire what a pleasure these boys company can be. Graham's book though is at the top of my christmas shopping list and I wish him every success with it." You can buy a copy of Graham Cooke's book, "The Blunsdon Bloggers' Tour of Sweden", here. "Another great item from Ted. I do not know which of the many Golden Helmets from the earlier days of speedway ended up as the match race helmet and there are photos of Eric Chitty in WW11 with a 'Golden' Helmet. Jack Parker held the record after WWII of holding the Golden Helmet for the longest, nearly three years, and it was nicknamed 'Parkers Pension'. By the mid 1960's there was a challange once a month for the helmet and this was raced at tracks as a seperate item, with the Silver Sash (from the old P/L days, which I think in turn came from the days of a 2nd division in Speedway) replaced it as the event which would be raced for at every match the holder was at, vs the oppositions highest scorer. Briggo (Barry Briggs) always seem to win the Golden Helmet! Briggo was well known for his love of the West Ham track and was almost unbeatable on it. Malcome Simmons while riding for West Ham had taken the Silver Sash from Olly Nygren at Wimbledon, (not an easy task! ), and in his first defence of it at West Ham, poor old Malcome had to get......Briggo as the challenger! Barry went home that night with the Silver Sash to add to his Golden Helmet. I think in the days of the 3rd Divison in Speedway they rode for a Bronze Helmet. It may have gone monthly in the 1950's as from an old West Ham programme I have it shows that, On the 29th July 1952 at West Ham a certain very young looking Austrlian rider from Wimbledon called Ronnie Moore, challenged the holder for the Sunday Pictorial Golden Helmet Match Race Championship. Jack Young was the holder and he beat Ronnie twice, setting a track record in race one with a Speed of 49.09 miles per hour in a time of 73.4 secs, in race two he set the same time, beating the previous track record of 73.6 sec held by that young Mr Moore! And before you all write and complain, yes I know Ronnie is always classed as a New Zealander, but the programme said Australian, apart from a possible mis-print, does any one know why he may have changed countries as I though he was born in Tasmainia? "